The Mirisawetiya Vihara was built by King Duttugamunu. It is said that the scepter could not be moved by anyone. The land is spread over an area of 50 acres. 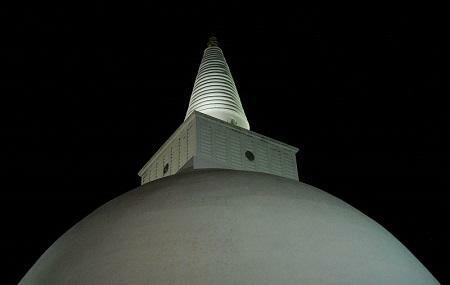 The Mirisawetiya Vihara is one of the most ancient structures in Sri Lanka and is a must visit place in Anuradhapura. How popular is Mirisawetiya Vihara? People normally club together Ranmasu Uyana and Basawakkulama Tank while planning their visit to Mirisawetiya Vihara. Best place to calm your mind. Best time to visit will be either early morning or evenings. Mirisa wetiya sthupaya is the first dagaba built by the great king Dutugamunu. Great King Dutugamunu built the mirisa wetiya in 161 -137 BC and united Sri Lanka under one flag. Sri lankans believed that King Dutugamunu had a sceptre that contained a scared relic of the Buddha. While going to the tank "Tissawewa", for a water festival, the King has planted the scepter in a certain place. When he came back, it is said that his men could not remove the sceptre from the place. Witnessing the miracle, the King decided to build a dagaba enclosing the scepter. Thus was the creation of Mirisawetiya. The significance of the sceptre is the fact that this was the king's "victory sceptre" for his battles with Elara, and by building the Dagaba around it shows the tremendous dedication that the King had for Buddhism and his spirituality. There are several belives about the Mirisavetiya name and most populer belive is. It is a custom among Buddhists whenever food is partaken, some of it is symbolically offered to the holy monks. In Sinhala, "Mirisaweitiya" comes from "Miris-Wetiya", which means a pod of Chillie. It is rumored that the King once forgot to offer a pod of chillie to the Monks before eating . As a token of apology, it is said that the King named the Dagaba "Mirisawetiya". Several Kings renovate this grate budhist stupa in different intervals King Gajabahu 1 (112-134 AC), put a new coating on mirisawetiya and King Voharika Tissa (214-236 AC). restore the umbrella of the dagebo and built the wall around Mirisawetiya The stupa and other buildings needed restoration after the Chola invasion and it is said that King Kassapa V (914-923 AC) did the restoration. King Kassapa V also is said to have built a massive mansion called "The Chandana Prasada", adjoining the Temple to house the scared hair relic (keshadathu), which was supposed to have been brought to Sri Lanka during the time of King Moggalana (495-513 AC) The Dagaba was again damaged by the recurrent Chola invasions and it is said that King Parakaramabahu 1(1153-1186 AC) did a comprehensive restoration and built the stupa to a height of 120 feet. The last recorded renovations around that period were done by King Nissankamalla (1187-1196 AC). A sacred place where Lord Buddha visited himself in Buddha era.